There is so much crap on TV, self-serving, ad cluttered or sensationalized. I find it refreshing and uplifting to see a show like ‘Extreme Makeover’ on ABC, which often brings tears to my eyes to see a needy family receive help of such magnitude! Whoever came up with this show and to all those who make it happen, big kudos. Sure it is on a very grand scale that few individuals could sponsor but I think it shows how people and companies working together can help those in need. Habitat for Humanity has also been doing this for years without all the fanfare and there are of course other groups and organizations who actually do good with the money and volunteer efforts. I just wanted to put in a plug for these groups and all those who help make such things happen. Recently, American Idol showed their charitable side and raised $76 million dollars in 2007 and has exceeded $60 million so far in 2008. You can still donate here if you’d like to do your bit. Imagine if all that war money (+$515,000,000,000.00) was diverted to these and other charitable groups who actually spend the majority of the money as intended, rebuilding and helping the US first, then extend these efforts to other countries. I wonder if other countries have a TV show like this? I’m sure they have charitable organizations for various purposes. That is one of the things the rest of the world gets so upset about…that Americans know so little about them and simply don’t seem to care about their cultures or events until it somehow impacts the USA, then it becomes important. We can do much better on so many fronts but we need strong leaders to inspire and guide us to constructive collective actions. As a side note of PISSED OFF, check out the money piles showing how much of OUR MONEY is being poured down a bottomless war for oil drain. 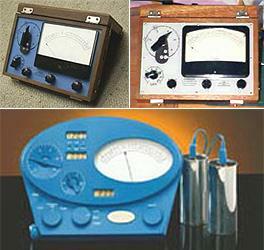 There have been plant water sensors and other feedback devices such as Cleve Backsters use of the extremely sensitive high gain e-meters used in scientology, to detect the fine electrical responses in plants. This is a novel approach and I’m sure a savvy inventor can see applications that might become the next fad. It’s not new technology by any means, just good that it is being used to educate and entertain the public. When I visited Cleve years ago in San Diego, he worked all night in his lab providing security for the Jewelry Exchange building where he had the entire 5th floor (I believe) to himself. It was once a DEA drug lab so had sinks and other accoutrements, as well as Cleve’s tools and microscopes which he used for his research. He had a plant with big leaves, a phylodendron I think it was, which he placed on a table between two chairs in which we sat. Attached to the leaves were wide, flat electrodes connected to an eMeter. I asked him what it was for and he laughed, saying it would tell him if I was lying at any time by watching the meter needle. He knew I was from Texas and wondered why the oil-rich Texans never came to visit as he needed the money for his projects. I asked him what he wanted and what was it for? He said he wanted $50,000 to do a project with football teams for remote sensing monitoring their cells in a faraway lab while they played on the field. Also that he’d like a project with NASA where astronauts who go behind the moon, out of radio reception, could have their vital signs detected by cellular transmissions from their living bodies to living cells being monitored on the earth. On the long defunct TV show, ‘That’s Incredible’, they had a segment interviewing Cleve Backster. I did a search on youtube for Cleve Backster and found a wide range of videos but none specifically with this segment which I have on VHS and need to post. In the segment, Cleve gave a female volunteer saltwater which she was to swish around in her mouth for a few minutes, then spit. It turns out that leukocytes outside the body will die within minutes, however, ORAL leukocytes can live up to 8 hours and more even outside the body. Cleve centrifuged the lighter fluids from the spit containing the oral leukocytes until a thick goo was left. He placed these living tissues into a petri dish and attached two electrodes connected to an EEG…note that he used an EEG (electro encephalograph) which is very sensitive and used to monitor brain impulses as opposed to an EMG (electro myograph) which is much less sensitive and used to monitor muscle impulses. The petri dish and equipment were in one room, while the woman sat calmly in another room on the other side of the lab. She was also wired up to show her electronic impulses WHICH MATCHED those of the remote living cells from her own body. Cleve asked her what would get her excited and she said if her boyfriend entered the room without his shirt. The readings from her body and the remote cells both jumped at the same time. To show that distance was no barrier to the transmissions between living cells, Cleve arranged for the woman to be driven to a dark and sleazy side of San Diego. Unfortunately, they didn’t have the funds for remote monitoring from that distance back then, but a van with a time synced camera watched her as she walked down a dimly lit street. The screen was split to show the petri dish back at the lab. A bum walked up the lady and asked her for money. The fear she displayed quite visibly in the video was reflected by sharp impulses of her own living cells back at the lab, several miles away and at the same time! This basic discovery has more applications than anyone can imagine but funding is needed to develop them. Imagine a communication system that CANNOT BE BLOCKED…there is more on KeelyNet.com spread out in various files but thats enough for this post. If you’d like to check into funding this and other advanced research, check out my lab project or contact Cleve directly if you want to know more from the link above. Update 04/28/08: Thanks to Cleve and Franci for reminding me it was a DEA, not an FBI drug lab, it was about 20 years or so ago so not quite 100% recall on my part. Also, they sent a youtube URL to introduce Cleves’ work. If you’d like to contact Cleve and Franci, perhaps with a funding offer for some of his projects, there are many of them which have commercial and health related possibilities that could be of great benefit and offer totally new insights. Time to Invest in Food? Is this a chicken little paranoia thing? Rice, corn and other food prices have gone up commensurate with gasoline and diesel, so it might not hurt to have a few weeks of food staples and water just in case. Better safe than sorry. The other alarming thing is all those who DON’T prepare and what they’ll do to get food and water to survive. Which of course means defense needs such as guns, bats, etc..
Posted in Ecology / Earth Science, Health, Miscellaneous, Orthodox Science, Politics | Comments Off on Time to Invest in Food? More help to counter the age of surveillance. Seems like there are dozens of articles for how to build RFID remote readers to scan your items and pull out your details without you suspecting anything. This info could come in handy. Refer to the ‘water as the new oil’ post here and on the net. And where is rainmaking technology when we need it? Reich cloudbusting or silver iodide seeding, is that the only way? I wish they had given the price for this thing, indications are its expensive to purchase and install. One day several years back, Christine, my neighbor in Dallas, was outside washing something very strange. It looked like a fat, slick pancake. She said it was a special mushroom that was healthy to eat, the juice made a healthy tea and they reproduced like wildfire in the right conditions. It was kind of spongy but I didn’t taste it, though she said you could fry it just like meat and it had a meaty taste. The name was kombucha mushroom. Wonder if it might be a candidate for this? Now THIS is an intriguing discovery. First a space station, then the Moon, then perhaps Mars. Soil, carbon dioxide and water for plants and food, excellent!